Manchaca, which takes its name from nearby Manchaca Springs, is nestled in the beautiful rolling hills about 10 miles south of Austin. Spanish land grants issued in the 1830s opened the land for settlement, and by the 1850s, stage stop Manchac Springs was established, bringing new settlers through the area. Many liked what they saw and settled in. The population grew in great bounds when the International & Great Northern Railroad laid track through Manchaca in 1881, which led to the building of a new school and several mercantile stores. 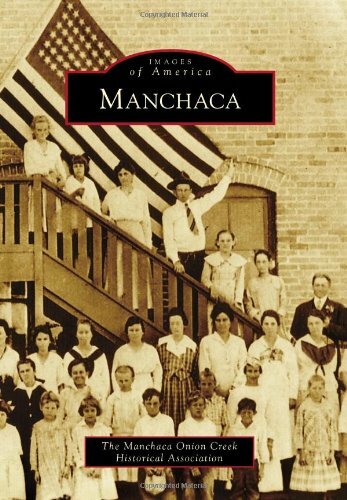 By the turn of the century, Manchaca had grown into a bustling community. The Manchaca Onion Creek Historical Association (MOCHA) is dedicated to preserving the history of the area. Officially organized in 2008, MOCHA has gathered documents, stories, data, photographs, and genealogies pertinent to Manchaca. Images for this publication were generously contributed by the Texas General Land Office, the Austin History Center, Texas Department of Transportation, Prewitt & Associates, the University of Texas, and the many families whose lives were woven together to form this community.